Laser printing has always been fast, easy to set up and affordable for low to mid-volume printing but has not been without limitations with regard to maximum sheet size and paper weight. Our new Iridesse paved the way for printing onto heavier grammage papers last year (up to 400gsm) and has now been upgraded to enable extra length print sheets as well. 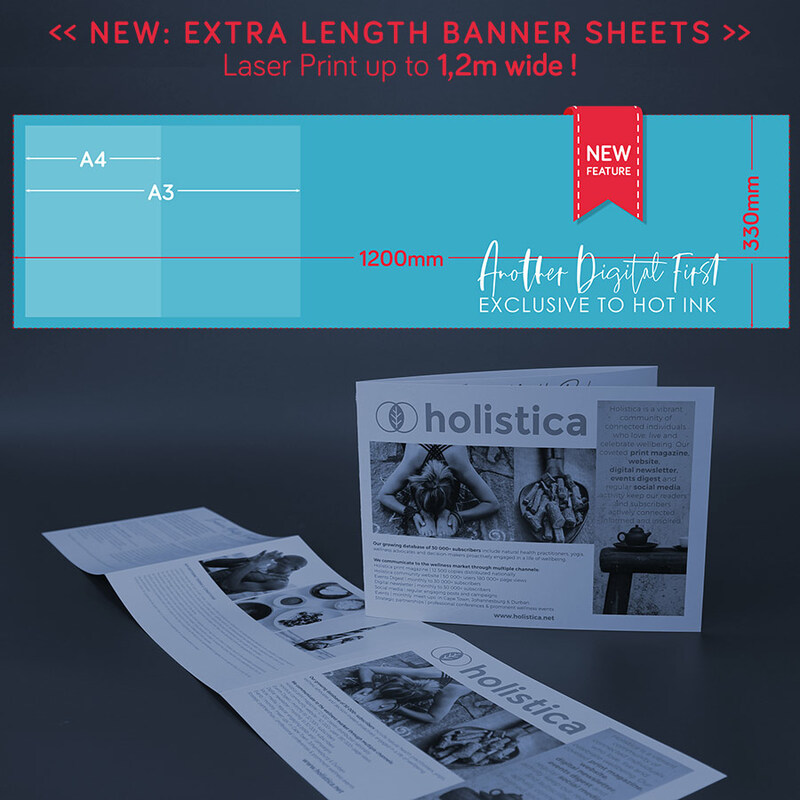 We can successfully print single-sided banners onto 400gsm sheets of up to 330mm x 1200mm(! ), with double-sided printing up to 720mm in length. Not only can multi-panel brochures, folders and menus now be done digitally, but the heavier grammage and larger surface area can now accommodate certain packaging projects too. All of this equates to a wider array of laser-printable options which will save you both time and cost on projects that would previously have had to be produced on a large format printer or a litho press. Combine this extra length feature with some of our unique finishes like metallic gold and silver or the brand new opaque white ink, and you have creative solutions that will really set you ahead of the rest by being bigger, better, faster and truly unique!